For all participants of 25th FIAMC Congress, our Technical organizer, Certitudo partner d.o.o., prepared two additional travel offers: Pre Congress Tour and Post Congress Tour. Day 1: Arrival in Dubrovnik (25/05/2018) Individual arrival in Dubrovnik. Welcome to „Croatia’s pearl of the Adriatic“! Dubrovnik is a beautiful city with some of the best medieval architecture you’re likely to see. The walled city has been a UNESCO World Heritage Site since 1979, making it among the earliest destinations to receive this accolade. Check in at hotel***. Free afternoon. Dinner and overnight in the hotel. 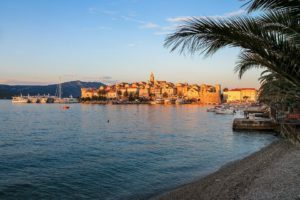 Day 2: Korčula, Ston (26/05/2018) Today we will visit the 6th biggest island in Croatia, named Korčula and Ston, a small fortified town on the Pelješac Peninsula. After nice breakfast in the hotel in Dubrovnik, our driver will pick you up by bus and drive you trough Pelješac peninsula (best known for its rich, world famous vineyards) to Orebić port. Embarking on boat followed with a joyful boat ride to Koručula town, the main town on the island. The main attraction of the whole town is the old town a medieval walled town with it’s towers. The old town center is dominated by the splendid St. Mark’s Cathedral built in the Gothic-Renaissance style, completed in 15th century. There is a local legend that Marco Polo was born in Korčula Town and you will visit Marko Polo’s house of birth. 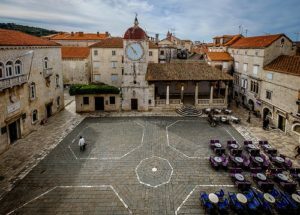 You will have free time in Korčula for lunch, coffee or wandering around the narrow streets of the town. Return from the island to the mainland. On the way to Dubrovnik, visit Ston, a town with the longest stone wall in Europe (5.5 km). You will visit Ston Salt Works, the oldest in the world. Salt has been harvest in Ston since Roman times and these particular salt pans have operated in much the same way for over 700 years; sea, sun and evaporation. Each pond, except one, is named after Christian saints. You can take a walk around the salt pools if you wish and also buy some souvenirs from the shop at the main gate. Return back to Dubrovnik, dinner and overnight in the hotel. Day 3: Dubrovnik city tour, Međugorje (27/05/2017) Today we will finally explore the rich culture and powerful history of Dubrovnik with a local guide. After breakfast, check out from the hotel. This day involves walking tour through streets of Dubrovnik, exploring the best sights of the city; Onofrio’s Fountain, Pile Gate, Franciscan Monastery, Stradun, Sponza Palace, Rector’s Palace, Orlando’s Column, the city cathedral and one of the oldest still functioning pharmacies in Europe, church of st. Blaise, a sanctuary dedicated to Dubrovnik’s beloved patron saint. Departure from Dubrovnik. 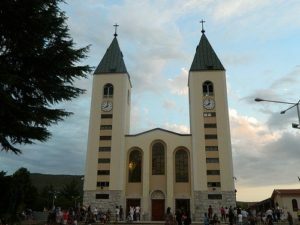 Arrival in Međugorje, one of the most famous Roman Catholic sanctuaries in the world. The sanctuary became known for the apparitions of the Virgin Mary, which began in 1981, and which continue to exist today. Upon arrival, check in and dinner at hotel. Day 4: Međugorje (28/05/2018) This day is all about experiencing grace of Međugorje. After breakfast at hotel, a walking tour of Međugorje with a local guide. 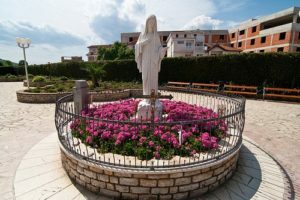 Međugorje became world-famous as a place of religious pilgrimage due to the apparitions of the Virgin Mary on 24th June 1981. when six teenagers reported seeing a bright silhouette of Virgin Mary and baby Jesus close to the place called Podbrdo (today Apparition hill). More and more people started to visit the place and it slowly became a major pilgrimage site in Europe. You will get an opportunity to climb the Apparition hill, local church and also a contemporary sculpture of Christ. Free time to go to the holy mass in the evening. Dinner and overnight at hotel. 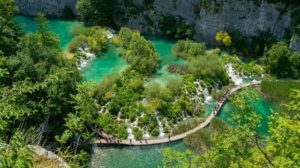 Day 5: Plitvice lakes, Zagreb (29/05/2018) After breakfast, check out from the hotel. The group depart back to Croatia. On the way to it’s capital, Zagreb, you will visit the most famous National Park in Croatia. The unity and harmony of 16 lakes and their rare natural and cultural value is not famous only throughout Croatia, but also worldwide; earning this remarkable national park a coveted place on UNESCO’s list of World Heritage sites. 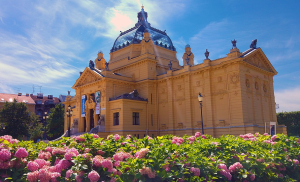 After a free time you will have to enjoy the walk and be amazed with the preserved nature of the area and a time you will have for lunch, you will join our transfer to your final drop off location in Zagreb. Arrival in Zagreb in the evening. * The organizer reserves the right to change the schedule of the program. Day 1: Trogir, Split (03/06/2018) First day of our trip, we will visit Trogir, charming medieval town protected by UNESCO and we will go to Split, Croatia’s second-largest city. Departure from Zagreb in the morning. Follows a nice ride by bus to the South of Croatia. We will make few short stops for coffee on the way. Upon arrival to Trogir, we will have a walking tour with a local tour guide. Trogir presents a good example of well-preserved Romanesque-Gothic islet town. We will admire the main attraction of Trogir, St.Lawrence Cathedral which is widely considered one of the finest architectural achievements in Croatia with its magnificent Romanesque Portal created by the local artist Radovan After a nice city tour, we will have free time before we depart for Split, the lagest city of the region Dalmatia. Arrival in Split in the evening. Check in at hotel. Dinner and overnight. Day 2: Split, Dubrovnik (04/06/2018) Nice breakfast in hotel. After we check out from the hotel, we will enjoy a guided walk of 1700 years old Diocletian’s Palace. 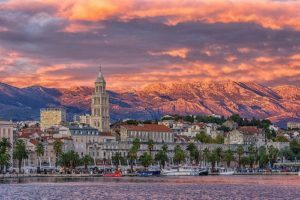 Considered to be one of the most imposing Roman ruins, Diocletian’s palace is certainly the main attraction of the city of Split. Don’t expect an ancient palace, nor a museum, this is the city’s living heart, its labyrinthine narrow streets packed with people, bars, shops and restaurants. The ancient palace has become the old town of Split. After the tour, we will have free time before we continue our trip along the coast. Arrival in Dubrovnik in the evening. Check in at hotel. Dinner and overnight. 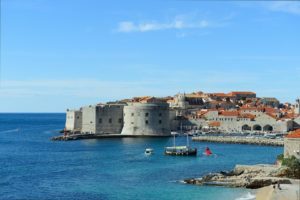 Day 3: Dubrovnik, Cavtat (05/06/2018) Today we will explore the rich culture and powerful history of Dubrovnik with a local guide. 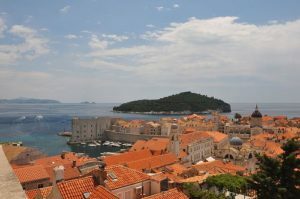 The city of Dubrovnik is also known as the Pearl of the Adriatic. We will also visit Cavtat, the most southern town in Croatia. In the evening we will be able to enjoy a unique dining experience in National restaurant Konavoski dvori. This day involves walking tour through streets of Dubrovnik, exploring the best sights of the city; Onofrio’s Fountain, Pile Gate, Franciscan Monastery, Stradun, Sponza Palace, Rector’s Palace, Orlando’s Column, the city cathedral and one of the oldest still functioning pharmacies in Europe, church of st. Blaise, a sanctuary dedicated to Dubrovnik’s beloved patron saint. Free time for strolling the streets of the „Pearl of the Adriatic“. In the afternoon we will visit the most southern town in Croatia, lovely Cavtat. A lot more „local“ than Dubrovnik, not flooded by tourists on a daily basis, Cavtat has its own charm. Here we will have free time to enjoy this little harbor, its rich and historical heritage along with the wide range of services offered to tourists. For the evening we would recommend a traditional Croatian dinner in a National restaurant, situated on the grounds of an ancient mill next to the River Ljuta. Beside enjoying a nice dinner and local food, we will also see a presentation showcasing how the old mill operates and how flour for bread is produced, as well as a presentation showcasing the wool press’ operation. After that we go back to Dubrovnik. Overnight in the hotel. Day 4: Međugorje (06/06/2018) This day is all about experiencing grace of Međugorje. 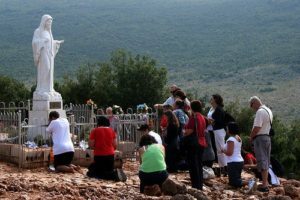 Međugorje became world-famous as a place of religious pilgrimage due to the apparitions of the Virgin Mary on 24th June 1981. when six teenagers reported seeing a bright silhouette of Virgin Mary and baby Jesus close to the place called Podbrdo (today Apparition hill). More and more people started to visit the place and it slowly became a one of the major pilgrimage sites in Europe. After breakfast, check out from the hotel. We leave Dubrovnik and drive towards border with Bosnia and Herzegovina. Uppon arrival in Međugorje we will check in at hotel. After you check in at hotel, you will have free time. You will get an opportunity to climb the Apparition hill, to visit local church and a contemporary sculpture of Christ. Free time for the Holy Mass and devotions. Dinner and overnight. Day 5: Departure (07/06/2018) A day to say goodbye! After breakfast in hotel, we are leaving Međugorje and Bosnia and Herzegovina, driving back to Croatia, Zagreb. Here you have a choice to spend a few more days in Croatia or go back home the same day. ** An optional dinner in National restaurant Konavoski dvori will be arranged. Price per person; 40,00 € for 3 courses menu. Beverage is not included in the price. Some of the dishes (those containing shellfish, fish and eggs, as well as gluten) may cause allergies, so please inform us in relation to any potential issues on time. Also if you prefer vegetarian menu, please inform us in advance! The dinner can be cancelled if number of participants are less than 20 persons. *Certitudo partner d.o.o. reserve the right to change any of the facilities, services, prices & accommodations, itineraries or vehicles described in online without being liable for compensation or refund. A deposit of at least 10% of the tour, per person is required within seven (7) days of booking or the reservation will automatically be cancelled. If you pay in full at the time of booking, standard cancelation fees apply. The balance of the price of your travel arrangements must be paid at least 30 days before your departure date. If the balance is not paid when due, we reserve the right to cancel your travel arrangements and retain your deposit.